LEFT: A three-part epergne manufactured by The Pairpoint Corporation and cut in the company’s Brilliant pattern on shape no. 1088, c1905. The trumpet-shaped flower vase has a quadruple silver-plated metal attachment that screws into a matching recepticle that adheres to the center of the shallow fruit bowl. The bowl itself has an integral glass plug that fits into an opening at the top of the base. 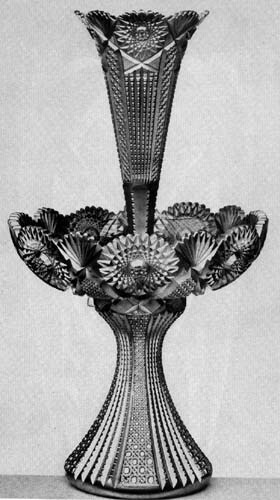 The base itself is “closed”, permitting it to be used separately as a vase. H = 19.5″ (49.5 cm), D = 10″ (25.4 cm). A rarity, the epergne sold for $2700 in 1982. RIGHT: Catalog illustration from The Pairpoint Corporation catalog, assembled from catalog sheets believed to date from c1904 to c1913. Published by the American Cut Glass Association, in co-operation with the Corning Museum of Glass . Copyrighted; used with permission. 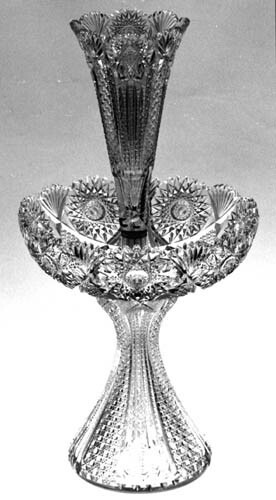 The catalog, p. 169, indicates that this epergne had an original list price of $50. A somewhat larger version (H = 22.5″, D = 12″) was also available, list price $74. The Mt. Washington Glass Works was the second glass factory founded by Deming Jarves. (The first was the New England Glass Company.) It was located in South Boston, MA and began operation in 1837 under the management of Captain Luther Russell. Two years later the business was transferred to George D. Jarves, as his father, Deming, originally intended. During the 1840s Henry Cormerais joined in partnership with George D. Jarves and the factory, under the name Jarves and Cormerais, expanded and new furnaces were built. William L. Libbey joined the firm in 1851 as a bookkeeper. Ten years later the factory closed and Libbey, in partnership with Timothy Howe, took over the business and made it a success. When Howe died in 1866, Libbey inherited his interest. Because the condition of the South Boston factory was deteriorating during the 1860s Libbey considered a move to a new location. When the building used by the New Bedford Glass Company, about 60 miles (90 km) south of South Boston, became vacant in 1869 Libbey purchased it and relocated his business to New Bedford the following year, changing its name back to the original Mt. Washington Glass Works. This name was equally appropriate for a New Bedford location as well as one in South Boston because the business was named for the highest mountain in all of New England (and perhaps chosen as a metaphor for highest quality). Libbey sold his interest in the Mt. Washington Glass Works in 1871. During the following year he became the agent (general manager) of the New England Glass Company in East Cambridge, MA. In 1876 the Mt. Washington business was re-organized, and its name slightly altered, to the Mt. Washington Glass Company. Four years later the Pairpoint Manufacturing Company, a small Britannia metal works, was established next door to the glass company. In 1894 the two companies merged and the Mt. 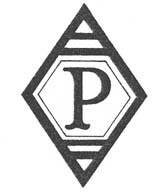 Washington Glass Company became “consolidated with, [and] controlled and operated by [the] Pairpoint Mfg. Co.” (from a Mt. Washington catalog). After 1900, however, when the Pairpoint company itself was re-organized as The Pairpoint Corporation, the Mt. Washington name was gradually discontinued. The glass catalogs issued by The Pairpoint Corporation make no mention of Mt. Washington glass. Nevertheless, an extensive line of brilliant cut glass continued to be made in New Bedford — under the Pairpoint banner — until the First World War and , to some degree, after the war. Wheel-engraving was also used extensively, especially during the post-war years. Several types of art glass, most of them registered with the U. S. Patent Office, were made by the Mt. 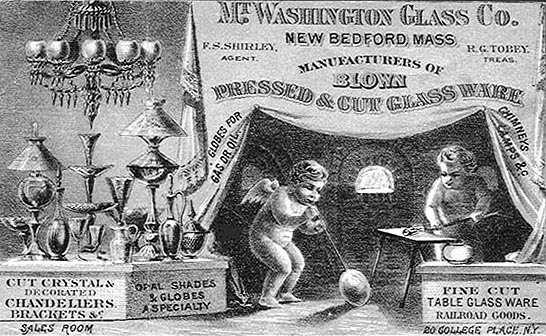 Washington Glass Company during the late 1870s, 1880s, and early 1890s. Padgett (1979, p. 23) states that the Mt. Washington trademark, below on the left, which was registered in 1883, “was used on a paper label and placed on Mount Washington cut glass for a number of years”. The initial “S” stands for Frederick S. Shirley who was the agent for the company at this time. After Shirley left Mt. 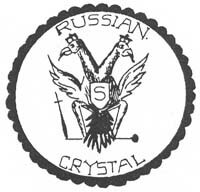 Washington in 1891 “the ‘S’ on the shield of the eagle was replaced with a ‘W’ for Mt. Washington” (Wilson 2005, p. 127). The Pairpoint trademark, on the right, was registered two years later and was impressed on metalwork. “When a silver mount bears the Pairpoint mark, one can assume that the [cut] glass is from the home factory [i.e., Mt. Washington]” (Swan 1986, p. 91). Neither trademark was acid-etched on cut glass made during the brilliant period. The catalogs listed here contain cut-glass patterns and in some cases original prices. This list is not comprehensive. Out-of-print catalog reprints, as well as original material not yet reprinted, may be available on loan from the Rakow Research Library at the Corning Museum of Glass (CMG). f = the library’s microfiche number. Excerpts from Mt. Washington and Pairpoint catalogs that have not been reprinted can be found in Wilson 1972, Avila 1978, and Padgett 1979.
c1885: MT. WASHINGTON GLASS CO. “A catalogue reprint of the 1880’s . . . ” previously dated 1879-1880 by the Rakow Research Library. Reprinted by Leonard E. Padgett, 1976. Revised date is based on the existence of the patented Martin Bowl (pat. no. 16,172 of 14 Jul 1885) and the death of A. H. Seabury, president (printed, on cover), on 17 Jul 1887. The date will have to be revised (to 1886 or 1887) if other illustrated shapes (for example, Tiffany, Lum) are found to have been patented later than 1885. Original prices and pattern names are available in a separate booklet (f-5612c). Out-of-print. f-5594c. c1893: CUT GLASSWARE. Patterns: Wheeler, Regent, Corinthian, Westminster, Hortensia, Bedford, Strawberry Diamond & Fan, and Flash. Not reprinted. f-2981. 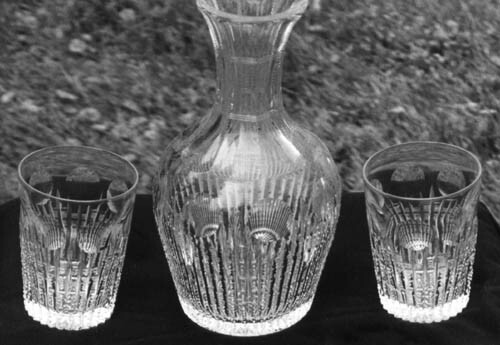 c1894: RICH CUT GLASSWARE. With original prices. Patterns: Admiral, Monterey, Corinthian, Bedford, Regent, Westminster, Magnolia, Wheeler, Priscilla, Strawberry Diamond, Strawberry Diamond & Fan, No. 12, No. 17, No. 33, Flash, Cut Star (i.e., Hobstar) Bottom (on a bon-bon), Spiral & Notch, Oval & Notch, and Lapidary (the last three on knife rests). Not reprinted. f-2976. c1898: MT. WASHINGTON GLASS CO. With original prices. Patterns: Congress, Henrietta, Cleopatra, Marigold, Wisteria, Clifton, Boston, Cambridge, Raleigh, Eureka, Jonquil, Yale, Arlington, Cedar, Saranac, Eclipse, Paoli, Pioneer, Mascot, Gretna, and Palace (the latter not illustrated). Not reprinted. f-243. c1904-c1913: THE PAIRPOINT CORPORATION. 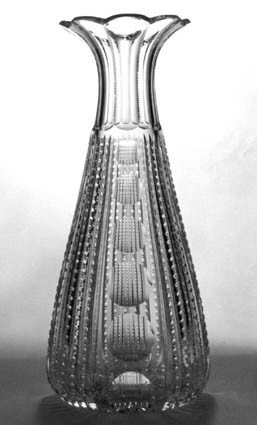 A composite catalog published by the American Cut Glass Association in co-operation with the Corning Museum of Glass. vii + 177 pp  Assembled from Rakow Research Library material selected from the following microfiche: f-2705 to f-2711 and f-2973. One-piece punch bowl. The Silver Leaf pattern by The Pairpoint Corporation on shape no. 145. c1905. D = 14″ (49.6 cm), D of base = 7″ (17.8 cm), h = 7.25″ (18.4 cm), wt = 17.5 lb (7.9 kg). Sold for $1500 in 1990. This file is largely based on the J. Stanley Brothers, Jr. volumes of patented material at the Rakow Library of the Corning Museum of Glass and the U. S. Patent and Trademark Office’s Web site. A composite catalog for The Pairpoint Corporation published by the American Cut Glass Association in co-operation with the Corning Museum of Glass, , and the early work of Revi (1965, pp. 48-61) have also been useful. It is not always easy to determine whether a patent issued during the 1870s was granted for an item’s shape or for its pattern. This is the case for the first patented pattern listed here. Its specification, however, makes the patent’s purpose unmistakable: “I am aware that glass vases having a bell or cone shape, and with flaring scalloped lips and longitudinal ribs, are not new, and I do not claim them. The distinctive character of my design is found in serrated and highly-polished ribs extending the length of the vase-body, the surface of which is ground off or lusterless.” (Frederick S. Shirley) Prior to the discovery of this pattern’s official name — which is found in the c1885 MT. WASHINGTON GLASS CO. catalog (Padgett reprint) — it was called “Polished Ribs” by collectors. The catalog also refers to the item as a 12″ Ribbed Vase. The name of the second patented pattern is given in an early catalog as Electric. It is often called “Angulated Ribbon”, a name that apparently originated with Daniel (1950, p. 200) who lifted it from the patent specification. Revi, who had access to this early catalog — which is apparently now lost — also used the records of the U. S. Patent Office. As a result he mentions two additional patented patterns, Thurber and Dauntless, that were available at the time the Electric pattern was cut, but which are unknown today. The scalloped edge of the dishes [is] separated by deeply cut grooves which extend from the base of the bowl to the rim. 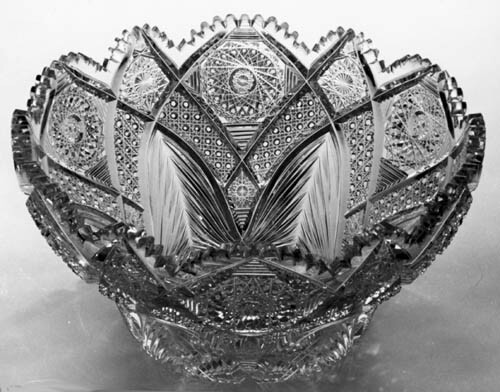 Illustrations of these bowls in trade catalogues showing the company’s cut glass wares indicate that the panels between the deeply cut grooves were ornamented by bright cuts in conventional designs, such as the “Russian”, “Strawberry-Diamond”, and “Old English Diamond” patterns (Revi 1965, pp. 51-52). Appendix 1 of MT. WASHINGTON AND PAIRPOINT GLASS by K. M. Wilson (Vol. 1, 2005) provides lists of design patents and utility patents. The only patent for a cut-glass pattern listed there that is also listed below is design patent 18,595 (Mirror Block). Cut glass is treated only briefly in Vol. 1, presumably because there are plans to include the subject in Vol. 2. All patents were assigned by their patentees to the companies, except those marked with an asterisk (*). These patents were retained by their patentees. The Boston pattern, with vertical punties, was designed by Andrew Snow, Jr. and patented by the Pairpoint Manufacturing Company on 18 Jan 1898. Patent number 28,179. H = 12″ (30.5 cm), base D = 5″ (12.7 cm), wt = 4 Lb (1.8 kg). Sold for $285 in 1985. Boston’s sister pattern, with the punties arranged horizontally, was logically named Cambridge, and was patented on the same date as the Boston pattern. Water set consisting of a 9″H carafe and two matching 4″H tumblers. Sold for $225 in 1998.